Aging in place is a popular term used to define a person’s desire to remain in their home as long as possible as age and disease changes their ability to perform the everyday tasks of living. According to AARP, 89 percent of Americans over the age of 50 hope to stay in their current home as long as possible. In concern and support of this growing trend, family caregivers and home care providers have become part of the solution. Over 34.2 million Americans provide unpaid care to adults over the age of 49 and 12 million individuals receive care from more than 33,000 home care providers. There are several ways that both caregivers and home care providers can make a difference in senior’s lives. · Create a safe home. Falls occur in approximately one-third of the population that is over the age of 65 every year—and in about half of those seniors who are 80 and older. Creating a safe home is one of the top priorities for those caring for a senior in an effort to keep them aging in place. A few of the recommended strategies include removing all tripping and slipping hazards such as throw rugs. Keeping regular pathways cleared and unobstructed and removing any and all clutter. Installing grab bars in strategic places such as in the shower and by the toilet—consider a raised toilet seat with support on each side. If possible, barrier-free showers or walk in tubs can make the bathroom—the room where the most falls occur—much safer. Make sure your parent’s home is well lit and consider installing motion sensor lighting. 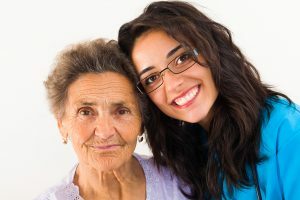 As a family caregiver, you can’t provide for all of your parent’s daily needs all the time. In order to go the long run, you will need to support and care for yourself as you care for your parent. And as your parent ages, it is likely that they will need additional support along the way. Running errands, providing transportation, preparing meals, offering social engagement and eventually helping with daily tasks such as bathing and dressing may one day be part and parcel of the daily routine. Getting a caregiving team in place now can help make the transition much smoother later. Reach out to family, friends, neighbors and community members. The truth is most people are more than willing to help in some form, if only asked. · Develop community contacts to help with tasks. A home care provider can help with everyday tasks, provide transportation, run errands, perform light housekeeping and offer companionship, but for the heavy duty maintenance of house and home, you will need outside contractors. Find companies that you and your parent are comfortable with that can provide deep cleaning once a month, attend to the landscape a few times a month, and contractors, electricians, and plumbers that can be called on for regular maintenance and in case of an emergency. · Take advantage of technology. There are an infinite amount of products on the market designed to help seniors age in place. Just a few of these include electronic medication reminders with alarms, medical emergency monitoring systems, video surveillance, and GPS locators.